By the 1840s "cellars under houses... are coming to be preferred for the purpose of keeping milk to either milk-houses, milk-vaults, or even spring-houses." In Delaware "dairymen charged higher price for 'cellar butter.'" The picture is from 1873 North Carolina. Of course, it is readily admitted that much depends on the mode that is adopted in the management of the dairy, commencing with the breed and feed of the cows, and ending with the manipulations of the butter; but the idea is gaining ground, that the best butter is to be made in a cellar, all other circumstances being equal: a remarkable revolution in public opinion, truly. 1848 "Of late, cellars under houses, properly arranged, are coming to be preferred for the purpose of keeping milk to either milk-houses, milk-vaults, or even spring-houses. Among the advantages claimed for cellars are, being at hand everywhere at a small cost; and keeping drier, thus less disposing to must." 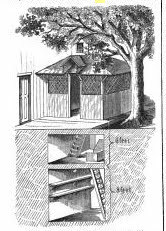 "a milk-cellar…in North Carolina… was built in connection with a very pleasant and comfortable although an old mansion. The entrance to the cellar was from the porch which ran around the house, and adjoining the rear or kitchen door. A handsome shade-tree and a grape-vine protected the entrance, which had lattice-work on three sides, with a door, also partly of lattice-work, in the front. A few steps led down into a very cool apartment about six feet below the ground, well lighted from a glazed cupola in the roof, and built of brick, and whitewashed. It was circular, with a raised hatchway in the center, which could be closed up tightly or opened at will. A trap-door at one side led to a stairway to a lower cellar, which was the milk-room. The upper apartment was used as a store-room for kitchen utensils, churn, and other similar articles. The lower cellar, when the hatchway was open, was well lighted. It was also of brick, and cleanly whitewashed. The floor was of brick, not cemented together. Shelves ran around this cellar at a convenient height on which were kept milk, cream, butter, and other things proper to a milk-room. The cellar was circular, about 10 feet in diameter, and in all about 14 feet deep. The lower apartment was ceiled over with wooden beams and a tight floor. The cost of the whole would not be beyond the means of almost every farmer, and its peculiar construction adapts it excellently to the needs of Southern farmers and planters on account of the extra coolness gained by the division into two apartments."